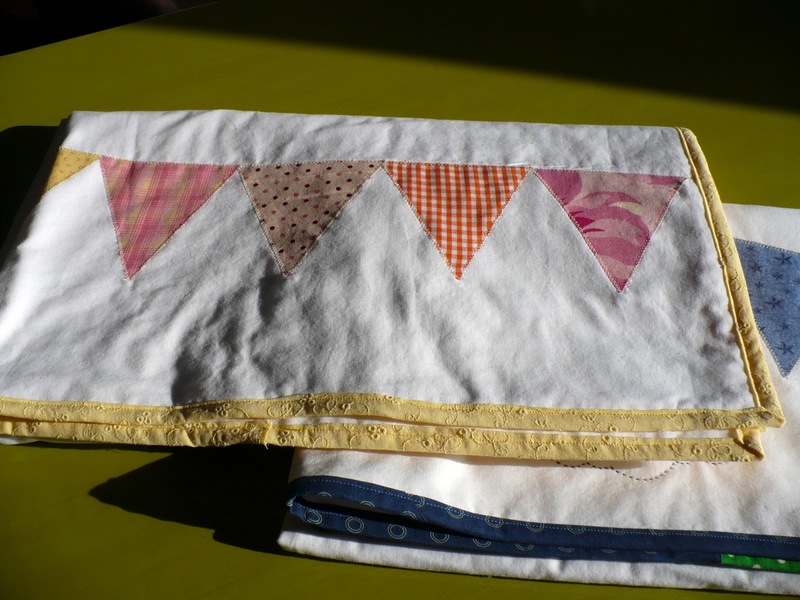 I have tried to make quilts for a few of my good friends when they have had babies. A little while ago, one of my really good friends had twins. 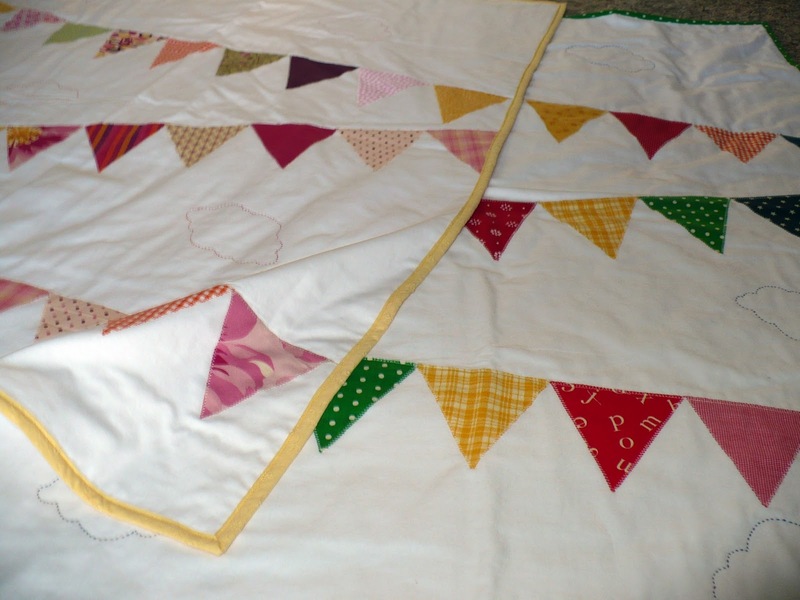 To be honest the thought of making two pieced quilts was a little overwhelming. At that time my life was on overdrive and I had too much to do as it was. 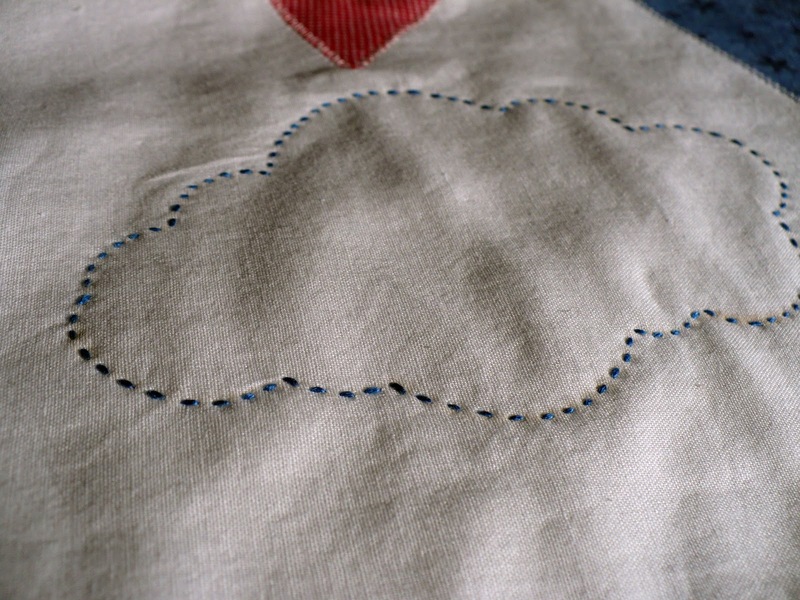 While searching for a fast and easy, yet cute pattern I came across this from A Pretty Cool Life. I love the colors and how simple it is. Since she had a boy and a girl, it was fun to change up the colors to make them gender specific. I made my quilts a little different size then the pattern says. They actually ended up being larger. When I went to the fabric store to get the white material, I came across a great sale, so I ended up buying material that is meant for bed sheets. This material is so wide. When measuring the width of the quilt I was able to just cut all the way across. The width of the material is the perfect amount for the front and back of the quilt. 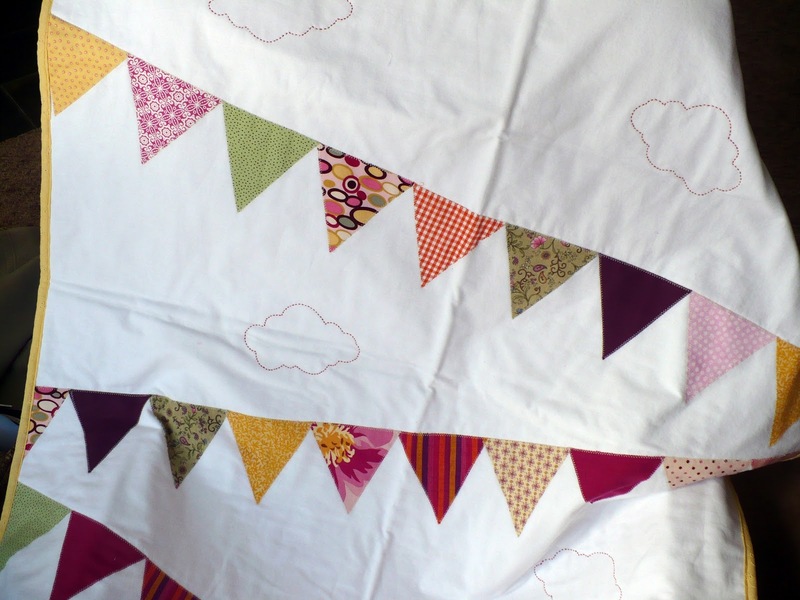 I also used more bunting because my quilts were larger. I wanted to add a little something to the quilt. I loved the simplicity, but felt it needed a little boost. I decided to add embroidered clouds as part of the quilting. 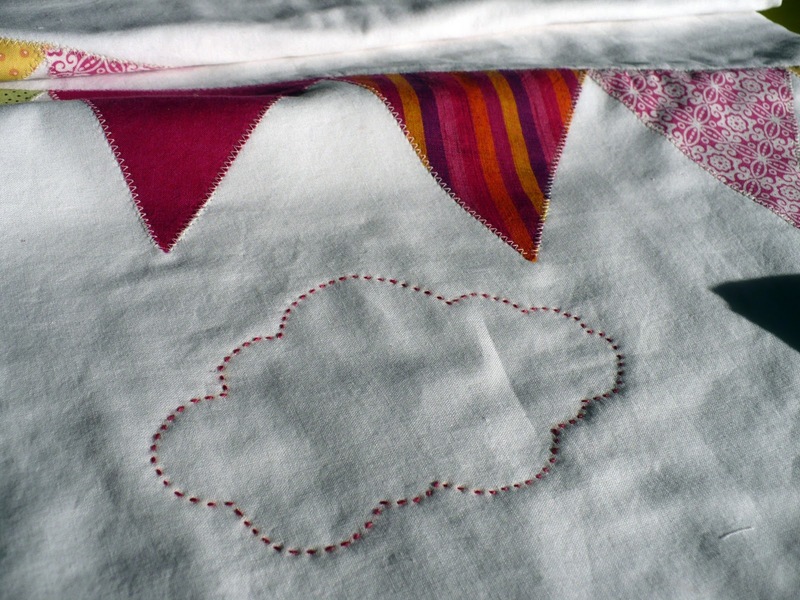 I wanted the baby girl quilt to be different from the baby boy quilt, so I decided to embroider pink clouds. 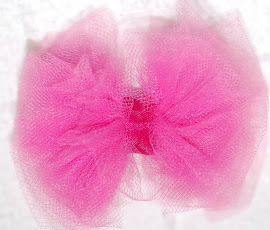 I love how they look with the pink fabric. This quilt was so easy. I am definitely going to make more if I ever need a quick project. This is darling!! Great job! From the last picture your binding looks just perfect! Any pointers? You are a much nicer friend than I am. I haven't even managed to make a quilt for my own son and he's a year and a half. You have motivated me to get going with that already. Oh my, so cute! I'm loving the bunting craze right now!!! Love this! Seriously! I would be floored if someone gave me a quilt... especially one with hand embroidery... for a baby shower. And you did two! Thanks for linking to the pattern. I'm thinking this would be a great one to use for a baby clothes quilt. My wheels are turning. So pretty and simple! Great job! This is so cute! I love the clouds. WOW! I love these quilts! I am inspired to make one for my sister's baby! That's really cute! 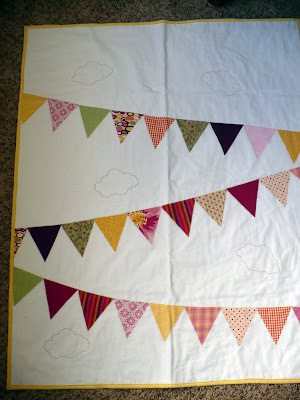 And I always love simple but fun quilts. Good job! I'm visiting from the Nineth Street Notions bloghop, and I'd love if you visited my blog, too! That is beautiful! How clever to add the embroidered clouds. What an adorable quilt! Thanks for linking up for Friday Favorites last week! Love it! I'm featuring you at I Made It! Monday on Ninth Street Notions tomorrow. Come visit, grab a featured button, and link up a new project!